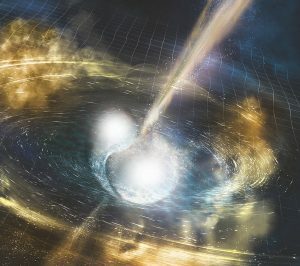 Could ETs use neutron star mergers to communicate? Artist’s concept of a binary or double star system, where the 2 stars are merging. Could an alien civilization use neutron star mergers to communicate across space? Image via NSF/LIGO/Sonoma State University/A. Simonnet. When it comes to the Search for Extraterrestrial Intelligence (SETI) most people think first of searches using radio telescopes to look for signals from distant alien civilizations. Other possibilities – such as optical SETI, which searches for extraterrestrial laser pulses – have become more popular in recent years as well. After all, as many people argue, why would an advanced civilization limit itself to using just radio? Now researchers in Japan offer a different and intriguing approach to SETI. What about looking for signals that have been synchronized with two merging neutron stars? Other scientists are taking this idea seriously enough to enable its publication in a major journal. The work passed peer-review and was published in The Astrophysical Journal Letters – aka ApJ Letters – on August 1, 2018. The overriding problem with SETI is that there is simply so much space, literally, to search. What are the best places to look? And when should we be looking?